The December WER report provides details for the LNG FSU ordered for storage use in Bahrain, questions whether the Ghana FSRU terminal contract could have reopened, discusses the continues downward trend of Petrobras and profiles two recent field closures that offer cautionary tales for FPSO lenders and GOM lease holders. 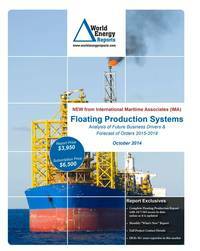 In the data section of the report are details for 252 floater projects in the planning stage, 72 production or storage floaters now on order, 275 floating production units currently in service and 27 production floaters available for redeployment contracts. Charts in the report depict the location where floating production and storage systems are being planned, operating, being built and to be installed. Accompanying excel spreadsheets provide the report data in sortable format. Information is current as of 22 December.